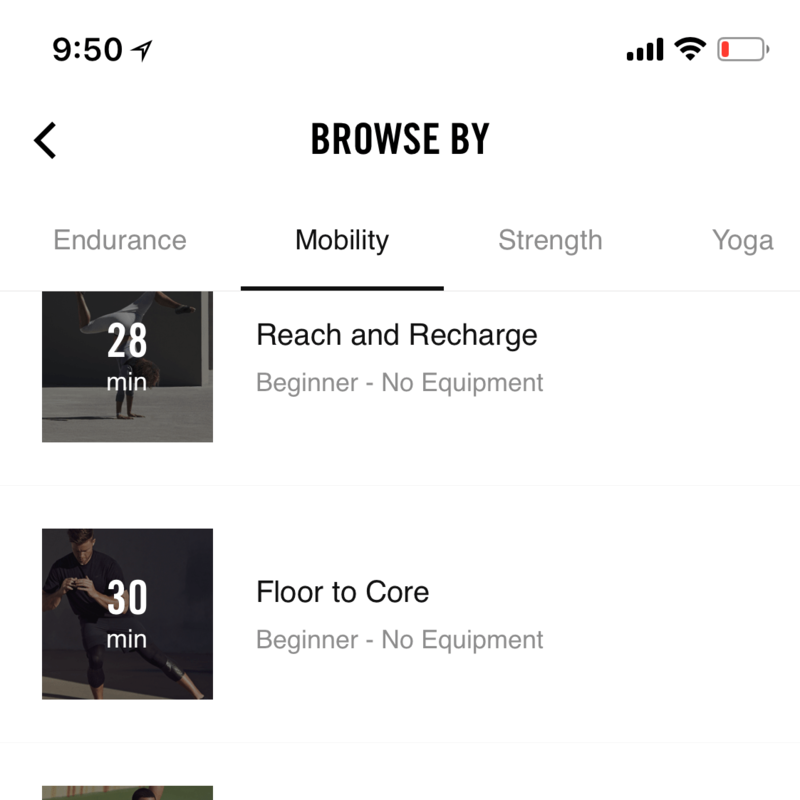 ** This is part of a series of posts on iOS apps, with the first one being about Nike Training Club, and the next one being here. Who’s it good for: Someone who has specific workout need that the Nike app doesn’t meet. Otherwise they seem pretty similar both in types of workouts in functionality, with Nike slightly winning on UI and production quality. Seems like it has a lower volume of workouts than Nike Training Club, but they may all be hidden behind a pay wall. I liked the fact that it has a master list of all the individual exercises. Not very many options, maybe it only comes with the premium plan? Had an interesting feature that let you choose how long each workout could be. Video quality was good, but a little plain because it’s all shot on a white background. It also works in landscape and regular mode on the phone. Has a “My Plan” section that lets you pick a fitness goal such as “leaner”, “fitter” , or “stronger”, and then it builds a 6 week play with 15+ different workouts. The goal of this post is to help other aspiring photographers understand the role that gear plays in the learning process, so they can avoid some of the mistakes I made. Had I understood more about photography, I would have been better able to make the right gear choices. In the end, I probably would have used fewer cameras and made less costly and unnecessary changes. I owned a series of point and shoot cameras from 2002 to around 2007. It started with the Pentax Optio S, then the , and then more than a few Canon Sd400s. I really felt the need to capture the world around me in photos, but I had no understanding of photography, and I didn’t want to carry anything big. The learnings from these cameras was that rarely would I ever get a usable photo. Photos were often blurry, too dark, or that people looked deathly white when I took a snap with the onboard flash. To be honest, I don’t know why I continued to shoot after the awful early results I was getting. So I went out and bought a much more expensive camera that I had no clue how to use, and I got equally bad photos, which made me even angrier. I went with the Canon Rebel T1i because of cost and the smaller size. I went a step further and bought the nifty 50 from canon, but then hated the focal length. It wasn’t until much later that I would figure out that on a crop body the 50mm acts like a longer lens, and in the long run my preference would be for wider lenses like a 35mm or 24mm. Coming from a point and shoot with a screen, I didn’t understand the optical viewfinder, and was totally confused when my photos came out looking different from what I saw through the viewfinder. Then micro 4/3rds cameras came on the market. I can’t remember which other cameras I was considering at the time, but the thought of interchangeable lenses in such a small package was really appealing. What pushed me over the edge was that I found the GX1 on sale at B & H for something like 250 or 300 dollars, and was able to get some lenses like the 45mm 1.8, and the 20mm 1.7mm,. How did it go? Well, it was by accident, but this was the first camera that I finally got some decent shots from. This was what I had been working towards. I wasn’t getting a ton of keepers, but out of each session I’d get one that looked decent, and that got me hooked. I finally started to figure out focusing modes and how to get the right things in the photos in focus. I loved the size, and took the camera with me everywhere. So why did I switch again? Well, first, I had a friend who wanted to buy my Panasonic camera for what I paid for it. Second, I had been struggling to figure out how to use the Panasonic on my own, I just didn’t find a ton of resources on the internet explaining how it worked, and I wasn’t technical enough yet to figure out the user manual. A good buddy of mine, had an Olympus OMD EM5 and it was revolutionary at the time. The image stabilization was incredible for low light, and after reading up online, I saw that a lot of people where writing and sharing tips about this camera. I made the jump and this is where I really started to get an understanding of focus modes, exposure modes, shooting manual, etc. I started consuming every bit of content online, found a book that helped unpack the mysteries of the camera. And made the first real steps that I would now consider to be an actual understanding of photography. I had the camera for 3 years, and ended up buying lenses like the 45mm 1. 8, the 25mm 1.8, the 75mm 1.8, the 12-40, and the 45-150mm. This camera got me so sucked into photography that I even shot a friends wedding as an excuse to get better at shooting. Having a camera with manual dials made it way easier to learn about manual exposure settings and to use them while shooting. The previous cameras I had put some of these things on some strange buttons (or buried within menus) that were not feasible to operate quickly. Live view! I figured out that I could get the LCD screen on the OMD EM5 to reflect the exposure settings that I had dialed in. I could watch in real time how my aperture and shutter speed effected the final image. This is when everything clicked for me. At this point I was making progress in my understanding of the camera, and some very basic photography technique. I just didn’t have enough grasp of that technique or understanding of light to get consistent great shots. The idea that other people where getting great shots because they were using full frame camera kept creeping into my mind, at which point I learned about lensrentals.com. Ergonomics matter, I really struggled to shoot photos at all with the a6500 because it didn’t have enough dials and physical buttons for all the controls I used for shooting. The full frame cameras didn’t focus as fast as the smaller ones ( at that time). The Olympus EM5 was actually pretty fast for the time, and the EM1 was screaming fast. I was getting better shots, but not a noticeably larger amount. Maybe 10% more, and mostly because the full frame sensor of the A7rii allowed you to bring so much of a photo back in post product, that I could salvage a photo with an ok exposure. And I was sold the second I rented the GH5. I really wanted a full frame camera for low light shooting, but ultimately I realized I didn’t shoot enough of that type of photography for it to make sense. I also realized that I hated the ergonomics of the sony cameras, and they weren’t as quick as the Olympus or the Panasonic (the A7rII was close). The nail in the coffin was video, which I had started to do more and more of. The Panasonic is the absolute king of video, and made it so much easier to shoot from a settings and from an ergonomics perspective. The menus in particular where an absolute pleasure to use compared to the Olympus and the Sonys. So what has this camera taught me? This is the first camera where the usability was so good that operating the camera just became subconscious and for the first time ever I was thinking more about the composition and artistic exposure of my shots. Things started to flow smoothly and I was able to make photos that looked more and more like my mind was imagining the scene to be. The lesson that’s actually starting to sink in now is “seeing light”. When I had my previous camera (the Olympus), I had learned a lot of the theories about light but I couldn’t apply those theories in the real world because I didn’t understand them enough, and I didn’t have the skill with the camera or the eye to make it happen. I’m just at the point where I spot good light and then work around that to make images that I love. So there you have it, a long arduous and expensive journey to learn how to shoot reasonably passable photos. The clear lesson at the end of this is that it does not have anything to do with the gear you have, and it’s got everything to do with how you use it. Check out GAS. but its a real misconception and something that is worth you spending time thinking about how to avoid if you are still learning. Every time I heard or read an article about GAS, I discounted it. My reasoning was “Of course you can say this, you have the luxury of fancy gear that can do everything”. I thought I was conceited and a little annoying. So now I’m on the side of having nice gear and fully understanding why everyone said that the gear isn’t what matters, am I a hypocrite? The key here is the learning journey and figuring what gear is going to help you make the journey the short or the least expensive. Buying more gear or nicer gear will not automatically do those things for you. Buying gear that works the way your mind works, or gear that is well documented so you can learn faster with free resources? Well that just makes sense. Find a camera that you enjoy holding, and that has enough free learning resources online so that you can learn how a camera actually works. Master that camera to the point where you can control it without thinking about it. Until you can do that, you don’t need a better camera. Now that you are not thinking about the camera, start thinking about and learning about light. Learn to see good light, and then apply your knowledge of the camera to capturing that good light. It’s an easy thing to forget, but photos taken on most iphones have the location of that photo embeded within the jpeg. This is useful when it comes to navigating your library and finding photos based on location, but its a bit of a privacy issue for anyone doing a lot of online publishing. After reading a bunch of articles on the subject recommedning 3rd party software, I found this great tip from the Sweet Setup. ** This post is a the first of a series, you can see the next one here. So I’m not a fitness buff, I’m just realizing that my body needs to be doing things pretty frequently if I want to do high action sports. My real thrill comes from kiteboarding , skiing, rock climbing, or surfing. And every one of those activities are inaccessible to most people who sit at their desk 8 hours a day. Lots of types and variety of workouts – I don’t want something that is running or weights only. A good interface during the actual workout – video is key because I need to know how to do the exercises with good form. I also need to be able to see the important information like reps or time while doing an exercise. Some sort of plan that helps group these workouts together and build towards more advanced workouts. The ability to listen to music while I workout. Free would be nice, but I’m happy to pay if it really gives me a more tailored experience and better workout results. Summary: This is the app to beat. Seems like most other apps copy Nike. What I didn’t Like: – I can never get the audio from Spotify loud enough without the coaching voice over being way too loud. I also wish they added more new workouts with higher frequency. Grouped into Edurance (89 workouts), Mobility ( 23) , Strenth (65), and Yoga (17) for a total of 194 workouts. Ranges from stretching to barbell squats and kettlebell swings. Really hits the sweet spot for my personal interests in working out. Each workout has a landing page where you can preview all the exercises and see the equipment needed. Video downloads quick and is high quality. The multiple angles help you really understand how to do the exercise. Has both repetitions based exercises (do it x number of times) and time based workouts (for 30 seconds , etc) that automatically count down. Only negative point is that I struggle to balance the spotify audio with the coaching audio. Nike Training club reduces the volume of background apps, so I have to crank things up which makes the coaches voice too loud. Gives you badges and counts how many times you’ve worked out. This has been good enough to help me know when I’m building momentum or not. I finally upgraded to the latest Magic keyboard and trackpad / mouse combo. Much to my disappointment, neither of these devices are equipped to quickly switch between computers. My current setup involves an 2010 Mac mini as a server for old archival footage, and a MacBook Pro for all my video editing needs. My wife also has an old 2011 MacBook Air which she sometimes wants to use with a keyboard. Now comes the challenge, switching the Mac keyboard and mouse / trackpad combo from one computer to the next. Maybe I’m a complete idiot, but in all my attempts it requires disconnecting from the first computer, then re-pairing with the next computer. This whole process usually takes me 5-10 minutes and its not consistent as sometimes the keyboard / mouse combo keeps trying to reconnect to the previous computer. Solution 1: Synergy is a piece of software that allows you to share a keyboard and mouse across multiple computers on the same network. I’m in the middle of testing it, and its been working fairly quickly, or at least faster than disconnecting and reconnecting the magic mouse / keyboard via the bluetooth panel in osx. Solution 3: Logitech has a bunch of keyboards and mice that can very quickly switch from one computer to the next. We got the K811 and it works great. The down side is that it’s not as nice as the magic keyboard, and it doesn’t fit the beautiful Hekseskudd walnut tray that we use for the the living room ( a mac mini hooked to a tv). I made this discovery by accident while searching for a way to travel without a laptop. While I’ll cover laptop-less travel in a different post, one thing that came from my search was the WD My Passport Wireless Pro, and more importantly auto-import. More to come on this device, but the real stand out feature was the auto importing or auto ingesting of images from an SD card. You just pop an SD card into the hard drive, and it automatically pulls the files into a predefined folder on the hard drive. What’s nice about it is that its incremental, so it doesn’t just mindlessly re-import all the files on the SD card, it only pulls the new files index the last import. There’s no selecting a destination, there’s no selecting files, it just works, automatically. I found it to be a really fast way to backup the video and photos that I was shooting while out in the field. It required less thought than having a laptop and having to focus long enough to organize your ingestion of files. I also found that it saved time when I got back to my laptop, so that I ddidn’t have to mess with all the different SD cards, i could just pull them from the hard drive, where they were all in one place. What if I don’t have a WD My Passport? To be honest, I’m not really using my WD My passport all that often, but I do like the convenience and time savings that came from auto import. I’ve been looking to find a way to get this auto import feature on my MacBook Pro, but it wasn’t all that straight forward. The closest I’ve found is Photo Mechanic 5, which will auto-ingest an entire SD card to a specific folder. As of yet, I have not figured out how to get it to do incremental imports, so its just bringing the entire SD card each time. Another option which might be coming in the future is Hedge. They have a media management app that helps creators ingest / import their content from SD cards. They have a lot of cool features like importing to multiple destinations, but auto import is not yet part of the solution. In an email exchange with the company they mentioned that they’ve received this request quite a few times and plan to build it into future versions. So why exposure second? Well, it’s more complicated, and you’ll probably want pictures that are in focus first before you start figuring out why your photos are too dark or too bright. Concept 1: Using exposure compensation in shutter priority to control exposure ( how dark / bright the photo is). So in the previous tutorial we used shutter priority to help us understand / control motion blur, and at which point we would get blurry images because the shutter was too slow. Here we’re going to use the same shutter priority mode, but we’re going to add in exposure compensation to change how bright or dark the scene is. Exposure compensation is a setting that let’s you manually override the automatic suggestions your camera is going to make on how bright or dark an image should be (we’ll use the term exposure going forward). So if you are shooting in automatic mode (often called “P” on most cameras), and an image is coming out under exposed (too dark) or over exposed (too bright), you can use exposure compensation to override the cameras settings. Exposure compensation also works for Shutter Priority mode and Aperture priority mode. [Assignment 1]: Look for a high key (scene that has a lot of bright or white tones), set your shutter speed to a level that will contain blur (likely over 1/250th if something is moving), and then use exposure compensation to get the right exposure. [Assignment 2]: Now look for a low key scene (one that contains a lot of dark colors), and set your shutter speed to contain motion blur, then use your exposure compensation to get a proper exposure. In this shot, I set the shutter speed to 200 to make sure nothing would blur. Then I just focused on the fitness tracker / airpods and let the camera choose the exposure. It did a surprisingly good job, but there a few bright spots in the image. Dialing up exposure compensation makes the image much too bright. Dialing it down removes the hot spots and makes it more moody. [Assignment 3]: Take things a step further and learn how to control exposure while in Aperture priority mode. If you set your aperture to something low like f1.4 or 2.8 you’ll blur everything thats behind your subject. If you set it to something like f5.6 or f8 you’ll see a lot more of the photo in focus. Then use exposure compensation to take a photo thats over-exposed and one that’s under-exposed. Try it in high-key and low-key settings. In this section I try to include a variety of high quality reference blog posts that might do a better job than I have of explaining the underlying concepts.